teenagedreamer100: What I got for Christmas! 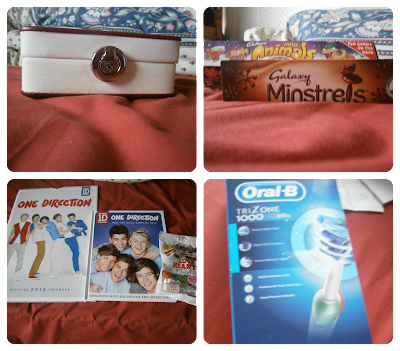 So this isn't to brag I just thought you would like to see what I had for Christmas!! I hope your not bored of these because I'm not! aha. So I got a vary of clothing this year. I got 2 hats which were from next which I sort of hinted at to my mom! Then I got a One Direction hoody which is so comfy and I have worn it nearly everyday since Christmas! I then had a Body Warmer which has fur on the hood. I really love it because it is a beautiful colour and it is nice and warm. I got a jumper which has a little dog on! It was from new look and it is sooo warm! 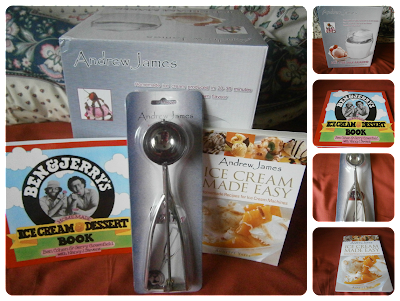 So my Auntie and Uncle got me lots of stuff for making ice cream, which I love. I haven't yet done any yet but when I do I will do a quick blog on it! There are some really cool recipes in it i can't wait! Is someone trying to tell me something?! I got soap and glory gift sets so I am ready for the rest of the year! Then I got a lipgloss set from M&S they are really pigmented! They give a great coverage an they are quite moisturizing I got a n-spa mango gift washy doo dah gift set which smells AMAZING! And to go with it I got a Minnie Mouse puff body scrubber, It is so cute and I love it. The last smelly thing I got was the So...? In Love! Which I have to say i am 'In Love' with... do you get it? The smell is amazing! The set I got had the body spray, perfume and a pretty lipgloss which is an amazing colour! Me and my Mom invested in a Tassimo which is great and is great for my mom because you can buy coffee pods everywhere but for me noooo! I'm not to keen on coffee, more of a Hot Chocolate girl me! Luckily my Mom bought me some Cadbury hot chocolate pods which are amazing and I love and they taste so amazing! Nommm! So here were some miscellaneous things which were given to me! There is a little jewelry box which is so sweet and will go perfect in my room! I had some little chocolates nommy nommy! One Direction stuff oh yeah! And a toothbrush yep I got a toothbrush as I needed a new one so my Mom got me an electronic one which is amazing! I want that jumper from New Look, so cute, it looks like one of the dogs from 101 Dalmatians..